Take Your First Glimpse at the Nike LeBron 11 "Volt"
Nike&apos;s been hard at work trying to perfect the LeBron 12 after a rather unsuccessful run with King James last signature sneaker, that often got shelved when it was game time. We thought that the "Reflective Stripes" colorway would be the last scheduled for the LeBron 11, but apparently Nike&apos;s got a couple more tricks up their sleeves. The first look at the Nike LeBron 11 "Volt" comes in the ever popular color from the Swoosh but with a twist. 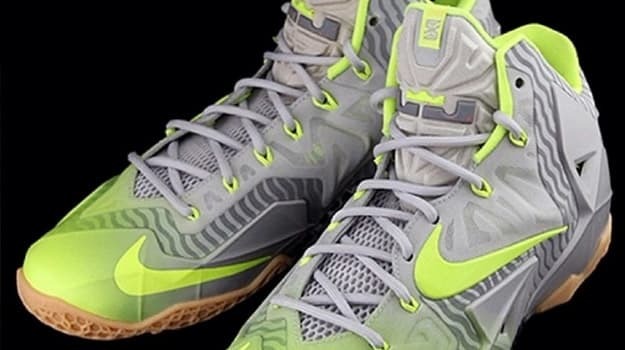 The upper is features a combo grey/volt gradient that works it way from the ankle down to the forefoot. Along the upper is gray stripes as well similar to those from the "Reflective Stripes" but doesn&apos;t appear to be in the 3M material. Nike did up this LeBron 11 with volt touches along the sockliner, branding, and lacelocks to make the shoe pop even more, and is nicely balanced out by what appears to be a gum outsole. This is the first look of the Nike LeBron 11 "Volt" so there&apos;s no official release date as of yet, but keep it locked for further info and let us know what you think of the latest colorway @SneakerReport.